Wulfestan emerged from the Church and looked at the distant forest. "They'll not move quickly. There is time yet." Sigered the priest put his hand on Wulfestan's shoulder. "Word has been sent. Ailred's brothers have been summoned. They will be comforted that he fell a hero. 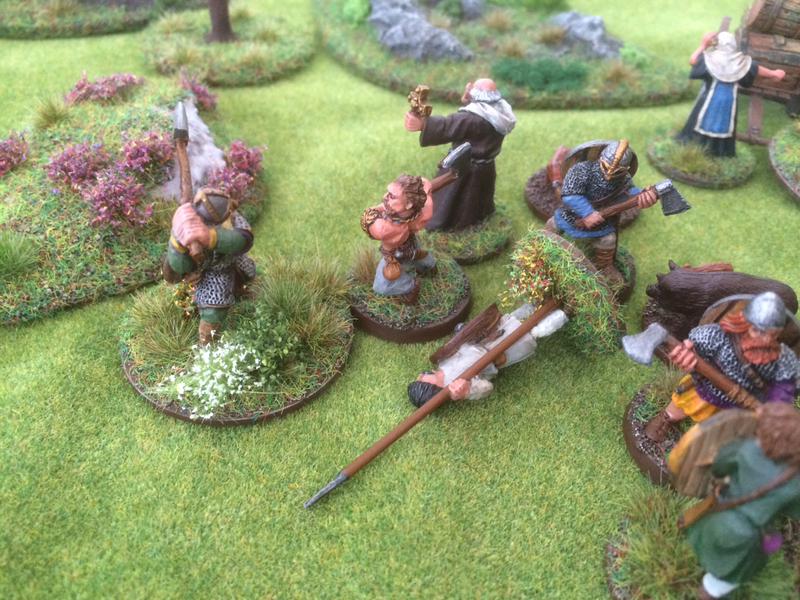 But I suspect that may not be enough..."
In the fading light Wulfestan reached for his axe. 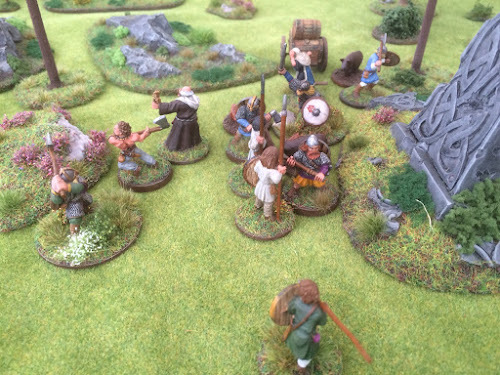 Johan drew his sword and prodded the old woman. 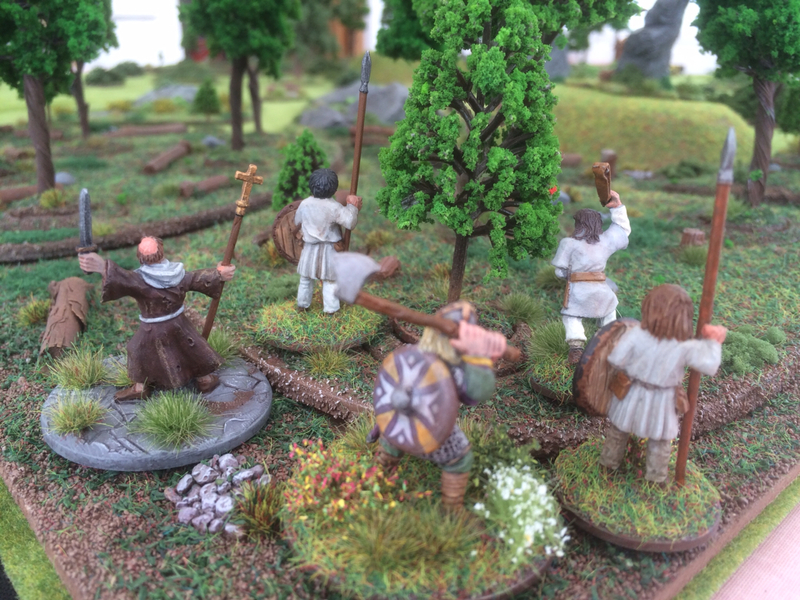 The Norsemen stood before the forest. 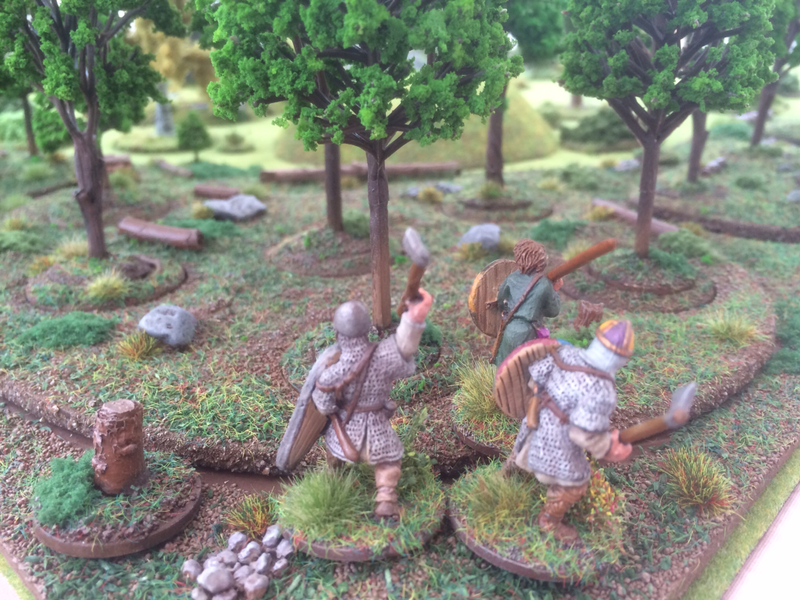 Their success with the raid and timely departure had given them a head start on the Saxons and they had chosen their path through the forest well. But Johan was no fool. 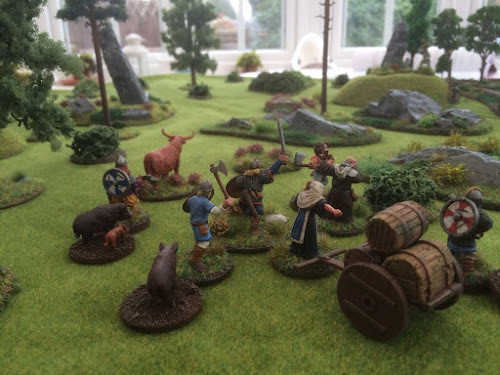 He knew that despite the fading light the Saxons would quickly mount a pursuit. 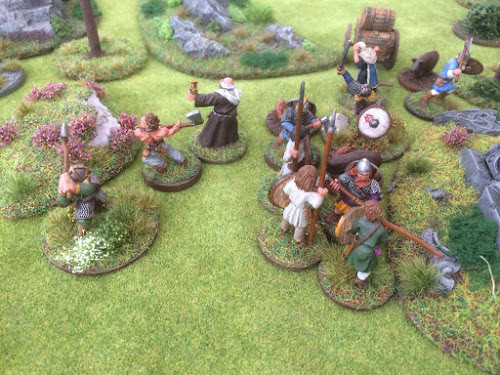 The Norsemen were heavily loaded, would they get through the forest before the Saxons caught them? The Saxon Thegn and his men eased their way through the undergrowth. 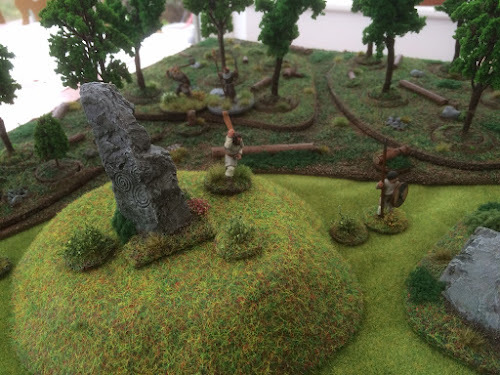 Meanwhile a warrior and two Huscarles who called the fallen Ailred kin appeared across the glade. Their hearts were set on vengeance for their fallen brother. 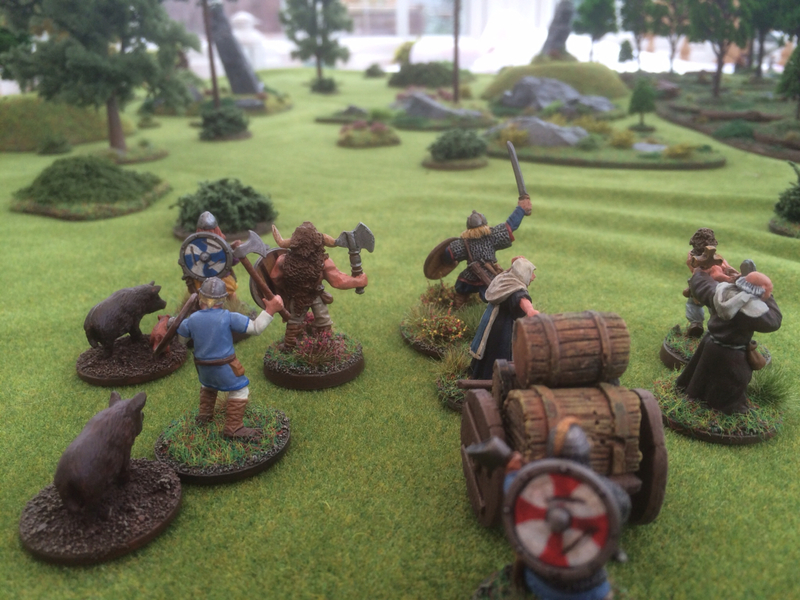 It was time for the Norsemen to make their move. The Saxons watched as the pagans picked their way through the forest glade. 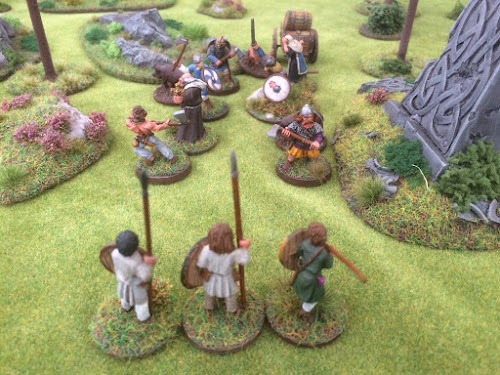 Suddenly they heard a loud bellowing and through strained eyes the Saxons saw a large shape loom out of the mist. "Wulfestan!" Whispered the Priest, "That bull. Nobody leads it, yet it moves with purpose." 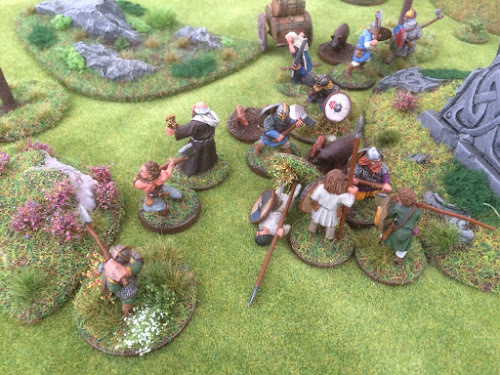 Moving with as much stealth as their weapons and armour allowed, the Saxons started to close their trap. 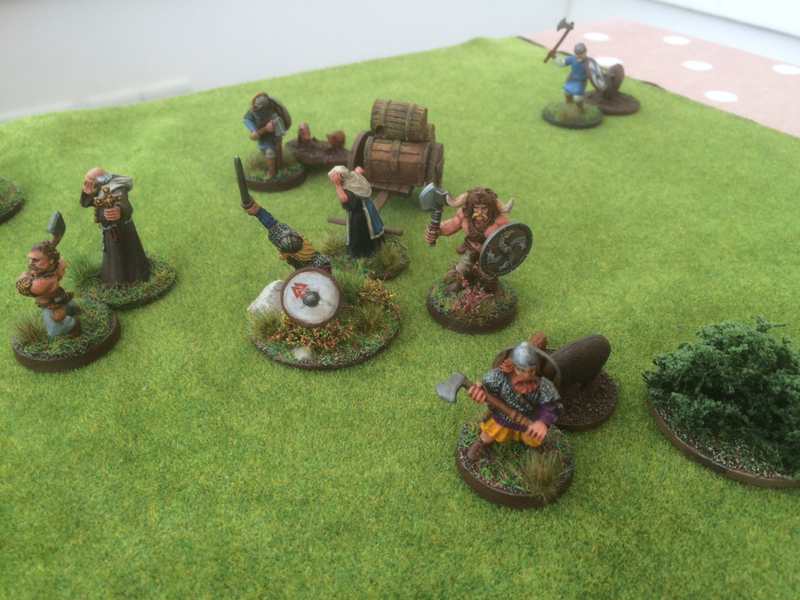 Johan felt uneasy. 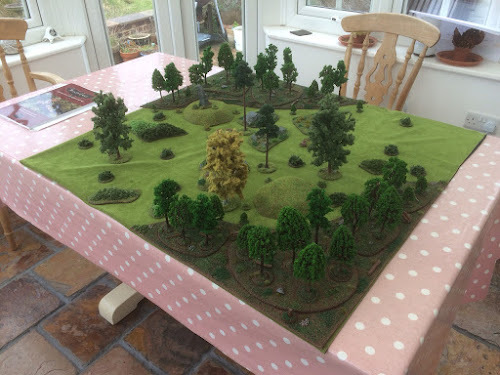 The trees in the distance were starting to thin, but the forest had fallen quiet. Much too quiet. The trap is sprung! 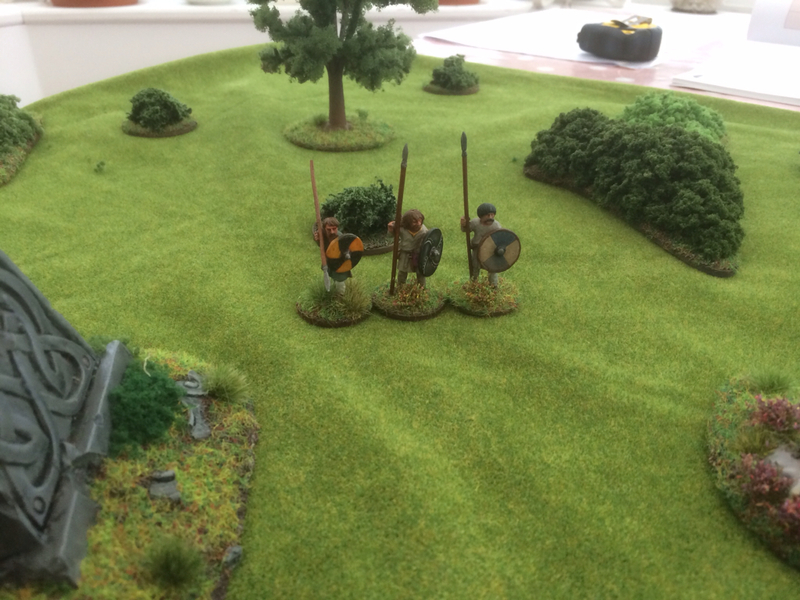 Saxon warriors rush from either side of the glade, forming a Shieldwall. Will the Vikings abandon their load and break through the trap, or hold onto their spoils and make a fight of it? From the trees emerges Alric, one of Ailred's brothers. Before him stands a mighty bull, the likes of which he has never seen. The earth trembles and the bull paws the ground. In disbelief the Saxon watches as the horns of the bull start to glow with a firey red light. 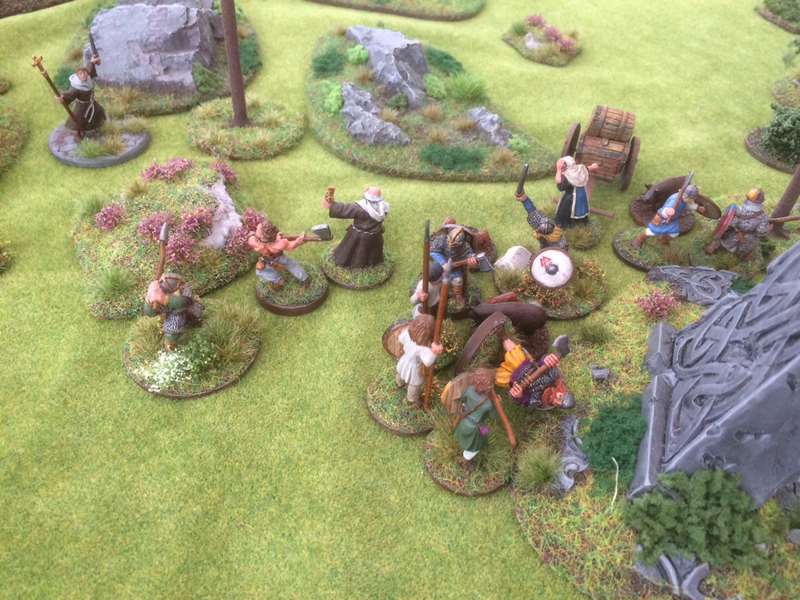 In an astonished voice Alric exclaims "What devilry is this?!" Suddenly Alric screams in pain as he is engulfed in flames, the force of the blast knocking him off his feet. 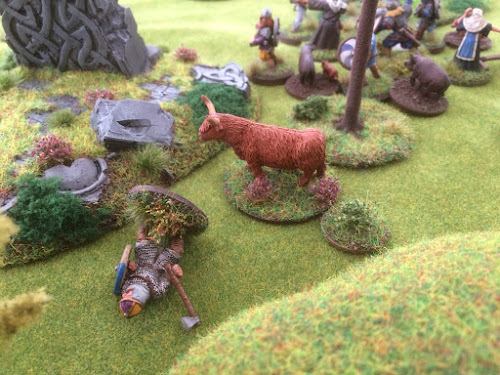 The bull drops its head and charges. 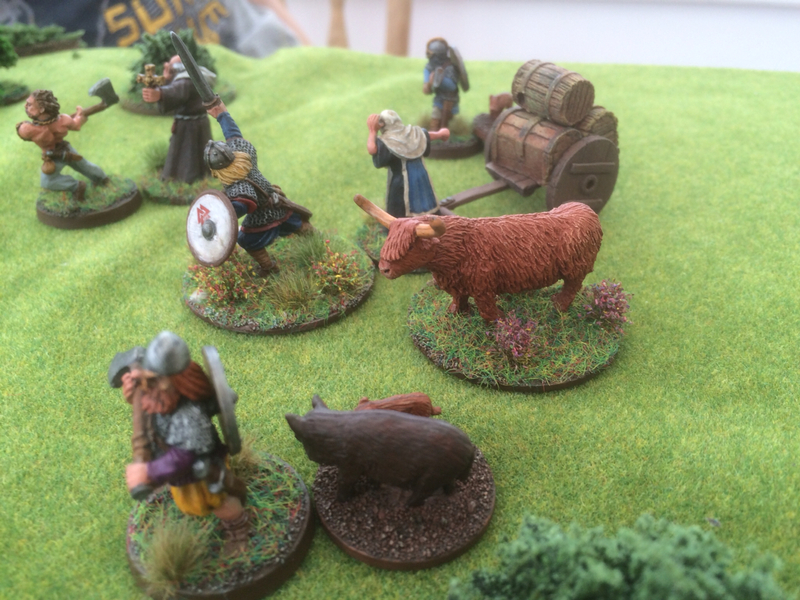 Alric feels the ground shudder as the bull approaches but, gathering his wits, pulls himself to his feet. Before him stands the bellowing beast. 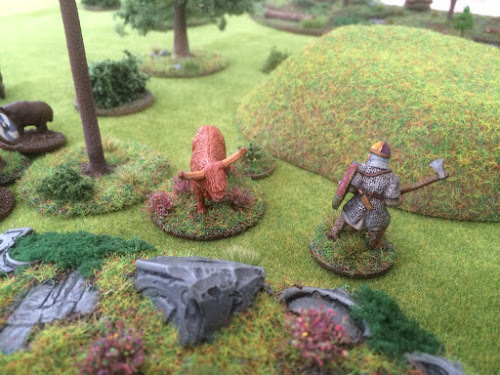 Alric swings with his axe and strikes the bull. It's legs fold and the bull crashes to the ground. Alric looks in awe and wonder. Before him lies not a beast, but a man! The Saxons are determined that none will pass. Wulfestan lunges forwards hoping to catch the berserker unawares. 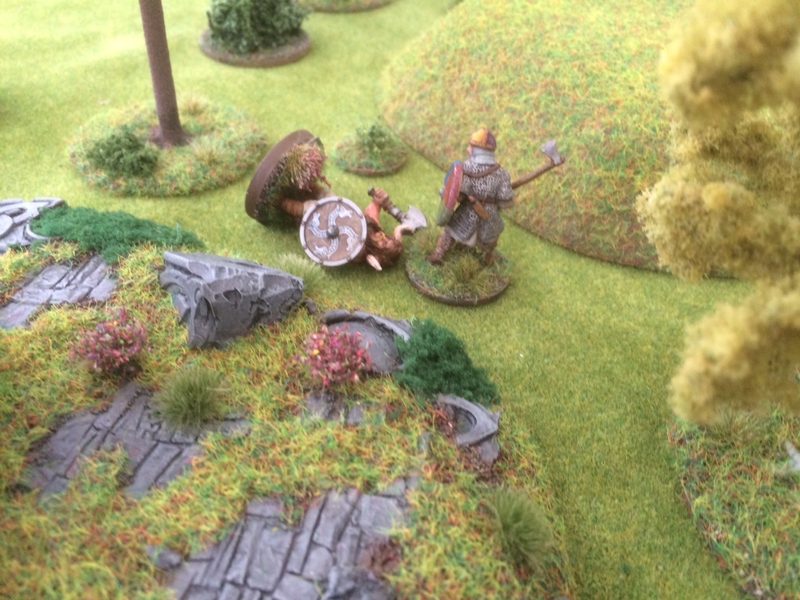 But Ulf steps back leaving the Saxon Thegn to swing his mighty axe at thin air. The Saxon warriors move forwards hoping to skewer one of the veteran Vikings. The warriors lunge with their spears and the Pagan falls! Meanwhile a Norse warrior, still clutching his spoils, weaves his way through the throng to attack the Huscarle who still stares in wonder at Ox. Kalf, one of the veteran Viking warriors, was down but not beaten. 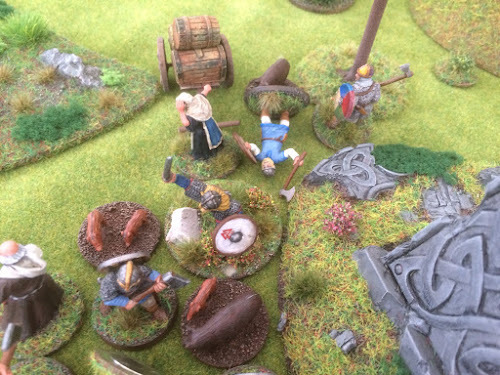 He drags himself to his feet just as Vandil, his brother in arms, swings his axe and fells one of the Saxons. Alric looks up at the charging Norse warrior and swings his axe. The warrior falls, his helm and the skull within cloven. But the tide is turning. 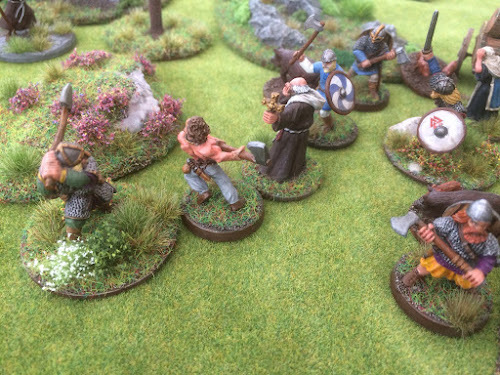 Roaring with animal rage, the berserker throws himself at the Saxon warriors, hacking at one where he lies. In desperation Wulfestan raises his axe. Sigered raises his hand to bless his Thegn. The berserker turns from his fallen foe and swings his axe at the Saxon Thegn standing before him. The berserker strikes hard. Wulfestan's fate will be decided by God. 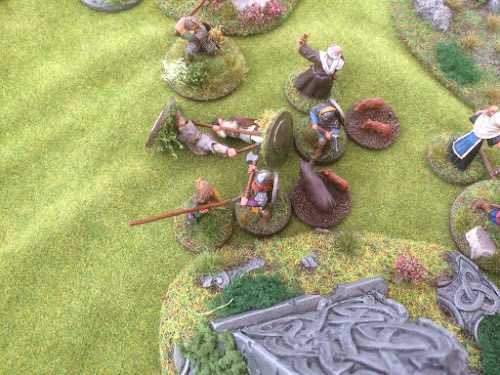 Wulfestan is swept off his feet. But before Ulf can finish him, Wulfestan rises and strikes back. In a cry of surprise and pain, the berserker falls to the ground. Aldwyn had watched as his brother Alric felled the great beast. Anticipating that the pagans may abandon their spoils and make a break for the edge of the forest, he had quietly moved through the woods to head off their escape. 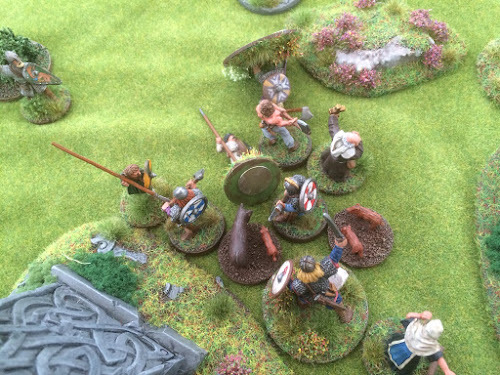 But the Norsemen were making a fight of it and two of their most experienced warriors were hewing at the Shieldwall before them. 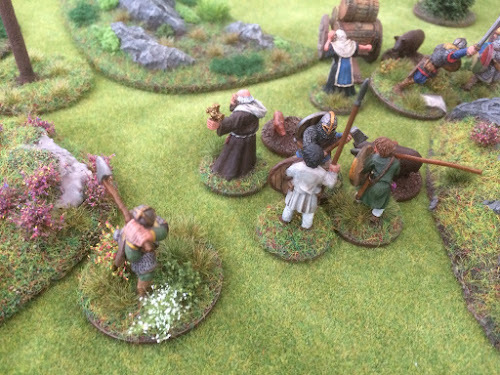 Aldwyn moves into support and strikes with his axe. 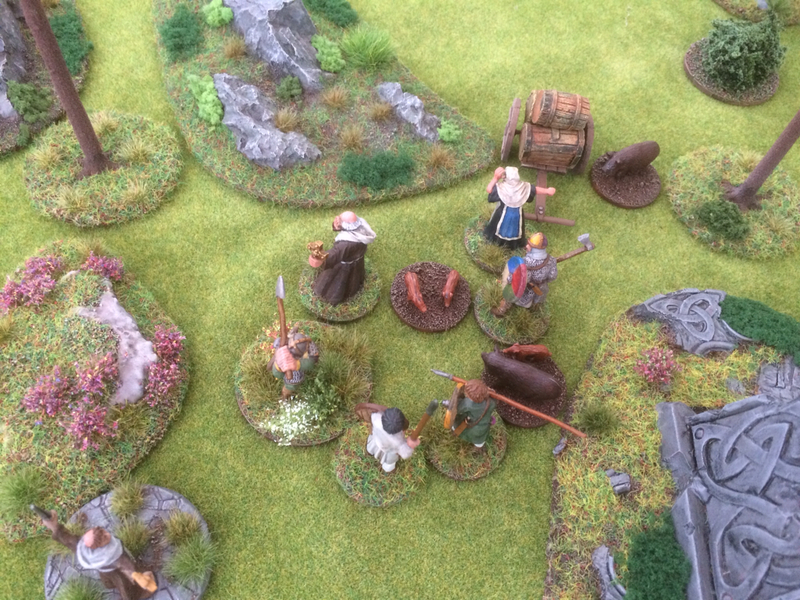 The pagan before him steps aside and returns the blow. Aldwyn feels a sharp pain and looks down at the Viking axe embedded in his chest. 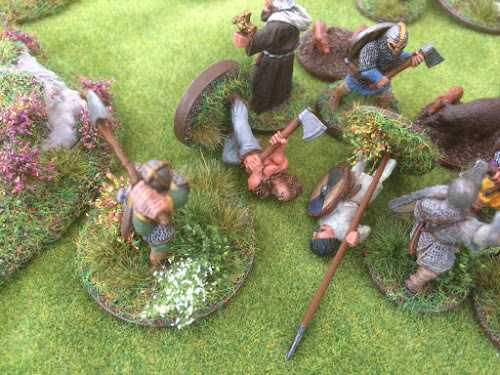 Seeing the Huscarle fall, a Saxon warrior thrusts his spear forward and a veteran Viking slumps to the ground. 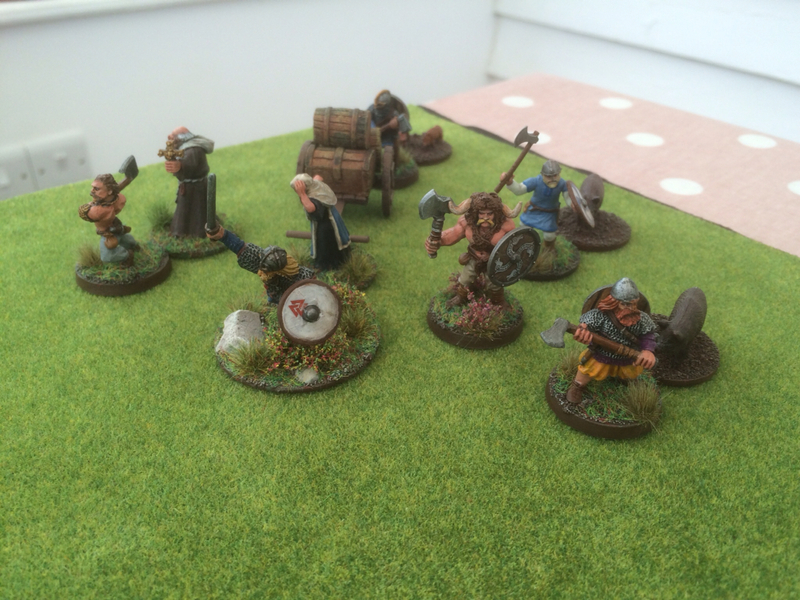 The Shieldwall reforms and pushes against the remaining pagan. 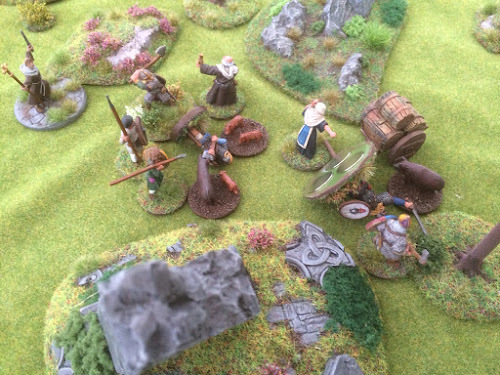 Seeing his flight thwarted, Johan pushes the Saxon woman away from the cart and charges the remaining Huscarle. 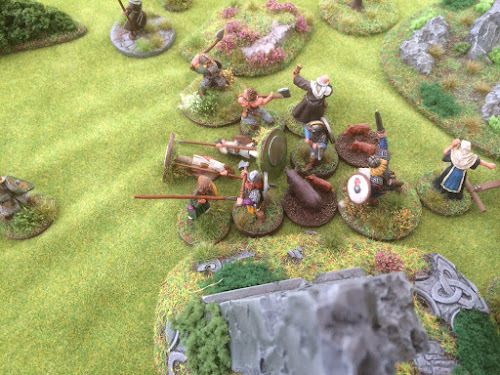 Behind him Johan hears a mighty thud as Wulfestan and his warriors hack down the only other Norseman still standing. 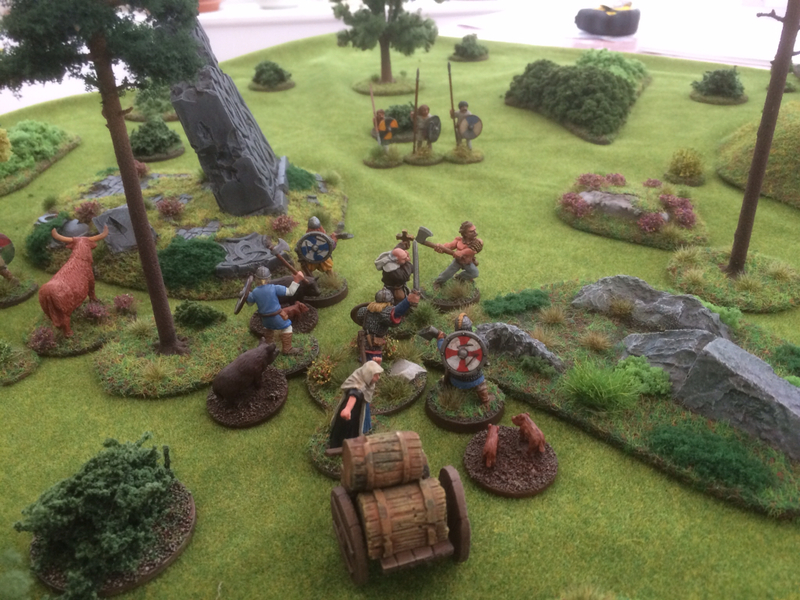 If Johan could only fell the Saxon before him his path would be clear to flee into the woods and disappear into the night. Victorious, Wulfestan surveys the scene about him. The priest moves from body to body. "A pagan is dead, but the others may yet fetch ransom". "What of Aldwyn?" Asks the Thegn. 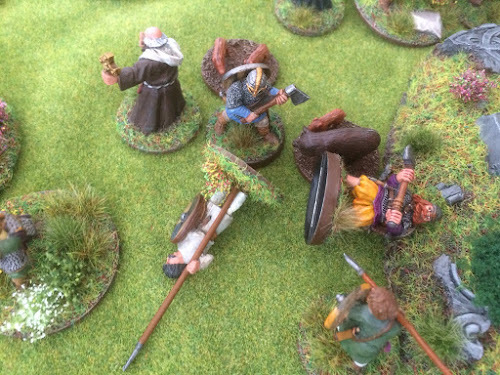 The priest kneels at the side of the fallen Huscarle and looks up at Wulfestan. "May God rest his soul". Great report! Really enjoyed the story telling & campaign aspects, plus your table & figures are excellent. 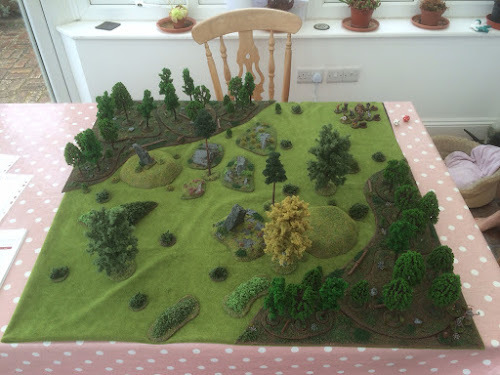 Another fabulous report and great to see that table again. This is what this game was designed for. Another gripping tale from your epic saga! 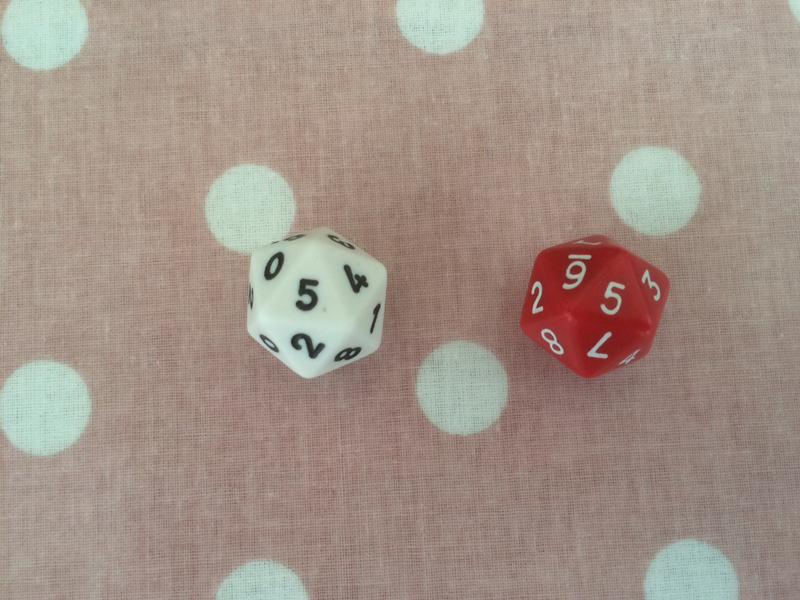 Thanks Gordon, the next one may be a bit dicey! I have to admit that I'm losing track of who is who :-( . Still, the action seems bloody enough to satisfy even the most avid gore fans! Yes fair point. I'd considered having a photo with names but thought I would get away with only using names for the main characters. 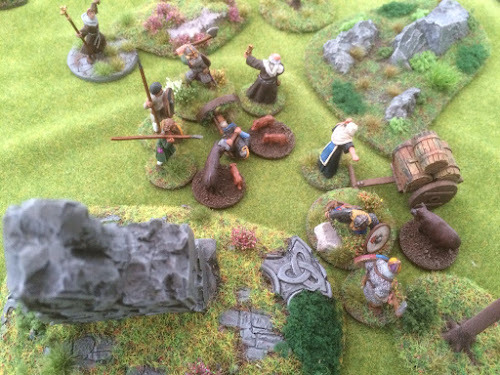 The problem is though that warbands are permitted to change between games in campaign play. Indeed, this becomes necessary when figures are permanently removed from play (ie fail their post game fate test). excellent report really enjoyed the story with some beautiful terrian. Cheers, been thinking about how to set up the next game. Hopefully going to play again tomorrow.